Hello and welcome to this week’s Top…11? Am I reading this right?…I am?? Okay, so we’re doing a Top 11 now, but there’s a fairly good reason for that…which you’ll probably have guessed within the next couple of weeks that it takes to get there. In the meantime, let’s take a look at the Top 11 cards of the new Lost Thunder set! Starting off with…Sightseer? Wait did I miss this card?…nope, just forgot it was in this set. But can you blame me? There’s only like 214 cards in the set, not including the Full Arts and Gold Secrets. That’s actually the largest expansion released yet – more than Sun & Moon, more than Ultra Prism, more than any other set! So you know, credit where credit’s due. Sightseer is a Supporter that lets you draw until you have 5 cards in your hand. That sounds boring at first, BUT there’s a catch: you can actually discard any cards you want prior to drawing for the effect. This is very useful, as not only can you toss out useless cards in your hand, but you can put things like Energy and Supporters into the discard pile to take advantage of later, or you could even use it to fuel up your attacks like Vengeance and Night March! So yeah, Sightseer has some potential to see play here and there. I don’t know if it’ll be anything stellar, but it’s a solid Supporter in its own right, and it’s arguably the second best Supporter in the Standard format (only behind Cynthia). Give her a spin, it’s not unlikely you’ll find a good spot for it! Arora Notealus: Can you believe we have a card for what is effectively “tourist”? Now I know Trainer classes are generally summarized, and those end up as Supporters usually, but I mean, we’ve literally got “Tourist: The Card” right here! There’s no getting around it. Pokemon has made tourists into cards. Next Time: The great dragon of the other realm returns again! We are here with another top 10….or rather, top 11 due to certain circumstances. Might as well tell you what happened. So, there are a group of cards formed into one archetype, and we were debating whether we would put all eggs in one basket (a single COTD) or reviewing it separately. Turns out that we are reviewing a countdown that starts with 11th place pick until 2nd place pick. Our 11th place pick is Sightseer! 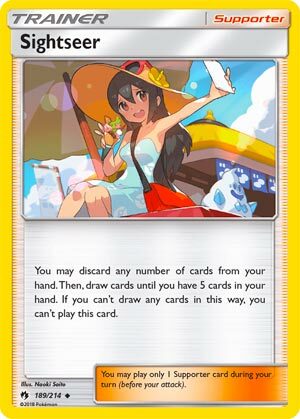 I had Sightseer as one of my personal Top cards of Sun & Moon Lost Thunder because of what she can do, to the point where she can fake being one of two cards. She lets you discard any cards from your hand. Afterwards you draw cards until you have five cards in your hand. With that, it can act like Psychic’s Third Eye or Professor Sycamore, depending on what you do. Actually, it’s a bit worse than both of those cards. For Psychic’s Third Eye, not only you can get to look at your opponent’s hand, but for each card that you discarded, you get to draw a card. Sightseer doesn’t let you look at your opponent’s hand, and you can’t draw cards if your hand size is more than five cards, even if you discarded cards. Another way to put it is that you dump your entire hand and draw five cards. That could be a good idea if you can’t make use of any card from your current hand; you will get a fresher hand. Except that Sycamore nets you seven cards instead of five. Both of those comparing cards has rotated out, thus erasing competition that Sightseer may face for the Sun & Moon format. Because of that, this card has potential in Standard for those who needs straight draw instead of shuffle-based draw (which we have too many of). Unfortunately for Expanded, she is outclassed by Professor Juniper/Sycamore as they draw more cards than her, which is one compelling reason to skip her. Limited is a good pull, since you can dump your hand for an even better hand. Sightseer (LOT 189) debuts in the Pokemon TCG from the Lost Thunder expansion set. This Supporter card lets you discard any number of cards from your hand and then draw up to five cards. It’s kind of like a baby Sycamore that lets you keep the Rare Candy or Rescue Stretcher or Stage 2 Pokemon that you don’t want to dump in your discard pile. If you’ve built your deck so that you have a lot of insta play cards or cards that can be recycled or if you want cards in your discard (it’s not just squids anymore Zeraora GX also wants to put as many energy as possible in the discard as quickly as possible and Nagadel wants energy in the discard too), Sightseer will probably benefit your offensive strategy. I’ve yo yoed a little bit on this card. I initially thought it was bad – that it was similar to Sophocles but maybe even a little worse, and we know how much play Sophocles gets right now. It’s definitely not Sycamore because even if you dump every card you have in your hand you only get five cards. I had a couple of people start talking me into it, though, and Mahone was running a couple of them in his Blacephelon build that I modeled my Blacephelon deck after, so I decided to give Sightseer a try. The low point was when I discarded four cards and only got three back because I had six cards in hand when I played Sightseer. It was extremely disappointing – this is definitely NOT a card for decks that have average or above average hand sizes. Again, there are probably archetypes that can better take advantage of this card’s limitations… but there’s no question that this card has limitations. I don’t think it’s better than Lillie and Tate & Liza, and honestly I’d probably rather run Apricorn Maker and just go put a couple of Zebstrika on the bench (BTW as of the time of this writing Zebstrika appears to be bugged on PTCGO – it would not let me activate the ability if I did not have any cards in hand… which was EXTEMELY disappointing). Just seems to me that we already have a lot of mediocre Supporters that are going to be better than this card in most situations. And here’s kind of my litmus test: if it let you discard and draw up to seven, we’d be all over this right? It’d basically be the same as Sycamore, maybe better since you could save one card and still get six or two cards and still get five. Capping it at five really just limited its playability and dropped it right into the same bucket with all of the other mediocre draw support cards available to us right now. Welcome as we countdown our Top 11 Picks of SM – Lost Thunder! If you’re new to Pojo, we usually countdown what we think are the best cards of the latest set. If you want to know more, check out this article here. We’re doing something a little different because we had a group of related cards nominated as a unit. The thing is, in hindsight I no longer believe the cards in question ought to all be reviewed together, and with the crew pretty evenly split on what to do, I pushed to tackle things a little differently. So, if this goes quite poorly, you’ll know whom to blame: me! I can’t complain, however, because this approach means we get to start with our 11th place pick, Sightseer (SM – Lost Thunder 189/214)! …which is why Sightseer is meant for decks that want certain cards in the discard pile, whether to combo with other cards or because the deck has many situation-specific cards which become clutter if a particular match-up won’t lead to those situations e.g TecH for Deck X that is useless when facing Deck Y. This still gives the card broad applications in both the Standard and Expanded Formats; it is just you have better general draw options in both formats. This doesn’t mean Sightseer is bad; far from it. Sightseer is about balancing draw and discard effects. Professor Juniper and Professor Sycamore were a little too generous in their balance, Psychic’s Third Eye and Sophocles too stingy, especially when your hand was small. Sightseer can be a nerfed Professor Juniper when she needs to be; discarding your hand to draw five isn’t going to define the format, but that is just two cards less. Like Lillie, she strikes me as a better Bianca, only in this case, it is because the discard effect gives you more options and an easier time using Sightseer, as opposed to Lillie being a Bianca that draws two extra cards if it is your first turn, and releasing at at when the metagame better suited this effect. Alolan Exeggutor (SM – Forbidden Light 2/131), Malamar (SM – Forbidden Light 51/131; SM – Black Star Promos SM117), and the “Roto Motor” series of Rotom cards are examples of existing cards (really, decks) that may suit Sightseer. Some already have enough options, especially with Shuckle (SM – Lost Thunder 16/214) also being in this set; its Ability lets you send three basic Energy cards from your deck to the discard pile when you Bench it from hand. Sightseer has less potential overall in Expanded; this is a Format with Battle Compressor, Professor Juniper, Professor Sycamore, etc. There is still some potential, however, as there are even more decks in this metagame that rip through their hands while needing to discard cards from hand. Still net negative compared to the Standard Format prospects. In both the Limited and Theme Formats, draw power is precious; the “Blazing Volcano” Theme Deck contains just one Sightseer, but the deck actually has several cards which combo well with it, some (but not all) from this set. Sightseer is a card that is almost scary to recommend because it reminds me so much of a previous time where I fell for the “Johnny Bait”. At least for now, I think we’re in a sweet spot where Sightseer is going to at least enjoy successful, competitive, albeit niche play. There is even a chance it will see widespread use as well, just as another generic draw card given we have only one obvious great (Cynthia) and one sort-of-obvious, kind-of-great in Lillie. Just remember, if a combo is too finicky or too complex, Sightseer’s selective nature won’t help enough; when you want to reliably field a Stage 2 via Rare Candy, you need search and not just draw power.